This document provides instructions for kerberizing Metron’s Vagrant-based development environments. These instructions do not cover the Ambari MPack or sensors. General Kerberization notes can be found in the metron-deployment README.md. Export the following environment variables. These need to be set for the remainder of the instructions. Replace node1 with the appropriate hosts, if you are running Metron anywhere other than Vagrant. Stop all Metron topologies. They will be restarted again once Kerberos has been enabled. Create the metron user’s home directory in HDFS. Define the current host as the KDC. Ensure that the KDC can issue renewable tickets. This may be necessary on a real cluster, but should not be on a single VM. Create the KDC principal database. You will be prompted for a password. This step takes a moment. 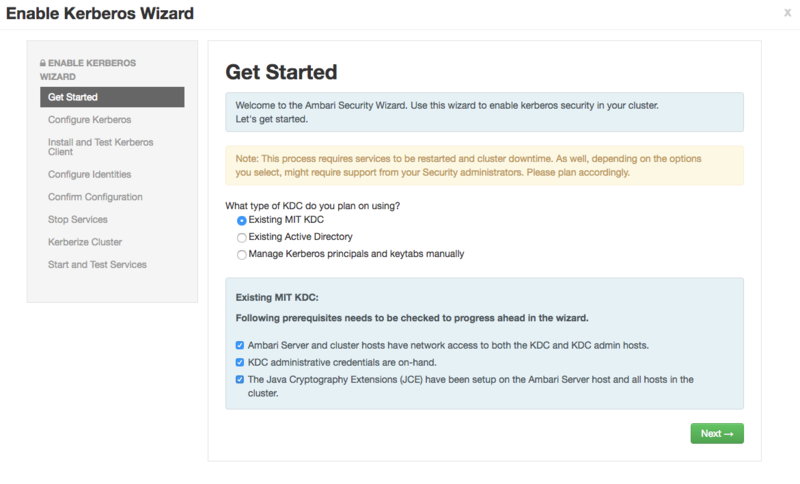 Start the KDC and ensure that it starts on boot. 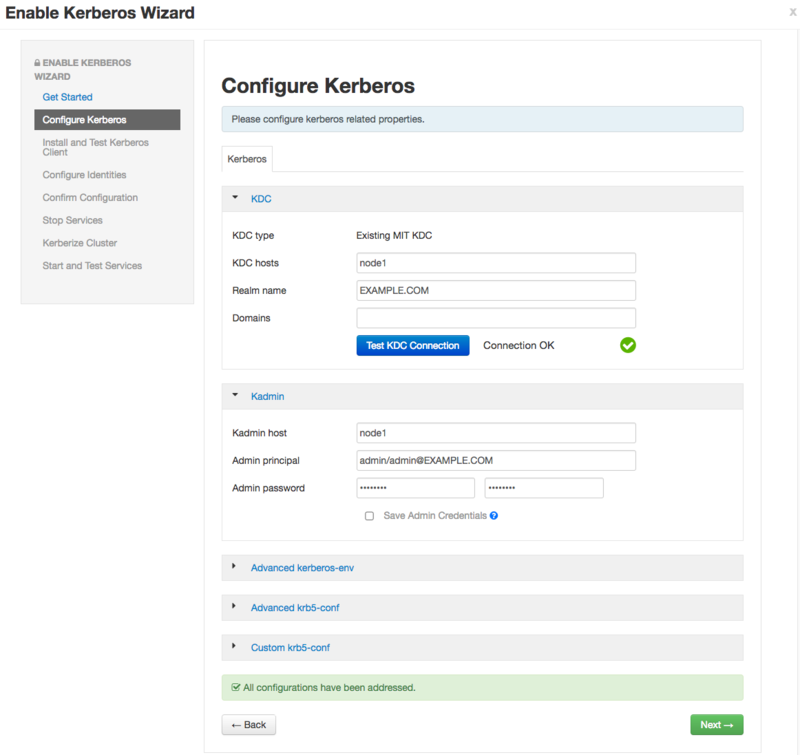 Start the Kerberos Admin service and ensure that it starts on boot. Setup the admin principal. You will be prompted for a password; do not forget it. Setup the metron principal. You will kinit as the metron principal when running topologies. You will be prompted for a password; do not forget it. Ensure the Metron keytab is renewable. Look for the ‘R’ flag in the output of the following command. If the ‘R’ flags are present, you may skip to next section. If the KDC is already setup, then editing max_life and max_renewable_life in /var/kerberos/krb5kdc/kdc.conf, then restarting kadmin and krb5kdc services will not change the policies for existing users. kadmin.local -q "modprinc -maxlife 1days -maxrenewlife 7days +allow_renewable krbtgt/EXAMPLE.COM@EXAMPLE.COM"
kadmin.local -q "modprinc -maxlife 1days -maxrenewlife 7days +allow_renewable metron@EXAMPLE.COM"
In Ambari, setup Storm to use Kerberos and run worker jobs as the submitting user. kadmin.local -q "ktadd -k metron.headless.keytab metron@EXAMPLE.COM"
Acquire a Kerberos ticket using the metron principal. Create any additional Kafka topics that you will need. We need to create the topics before adding the required ACLs. The current full dev installation will deploy bro, snort, enrichments, and indexing only. For example, you may want to add a topic for ‘yaf’ telemetry. Setup Kafka ACLs for the bro, snort, enrichments, and indexing topics. Run the same command against any additional topics that you might be using; for example yaf. Setup Kafka ACLs for the consumer groups. This command sets the ACLs for Bro, Snort, YAF, Enrichments, Indexing, and the Profiler. Execute the same command for any additional Parsers that you may be running. Add the metron principal to the kafka-cluster ACL. Grant permissions for the HBase tables used in Metron. If you are using the Profiler, do the same for its HBase table. Switch to the metron user and acquire a Kerberos ticket for the metron principal. Create the directory /home/metron/.storm and switch to that directory. Ensure the Metron keytab is renewable. See Verify KDC above. Create a client JAAS file at /home/metron/.storm/client_jaas.conf. This should look identical to the Storm client JAAS file located at /etc/storm/conf/client_jaas.conf except for the addition of a Client stanza. The Client stanza is used for Zookeeper. All quotes and semicolons are necessary. Create a YAML file at /home/metron/.storm/storm.yaml. This should point to the client JAAS file. Set the array of nimbus hosts accordingly. 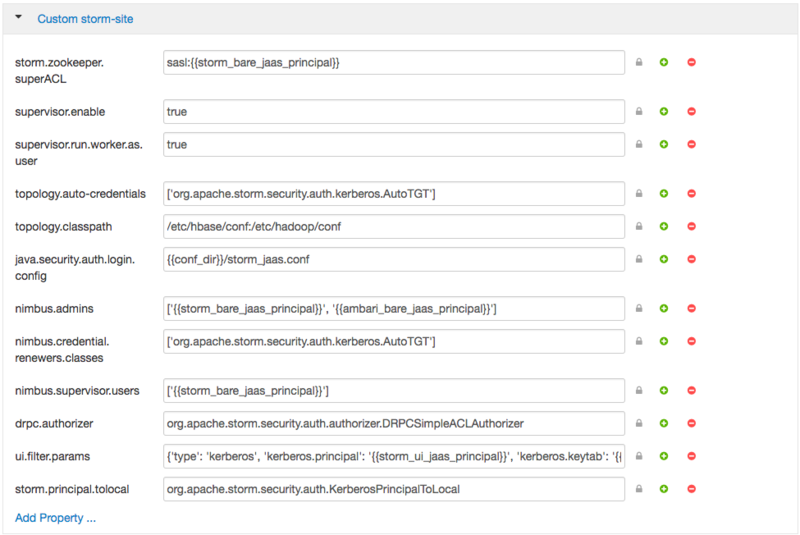 Create an auxiliary storm configuration file at /home/metron/storm-config.json. Note the login config option in the file points to the client JAAS file. Restart the parser topologies. Be sure to pass in the new parameter, -ksp or --kafka_security_protocol. The following command will start only the Bro and Snort topologies. Execute the same command for any other Parsers that you may need, for example yaf. Restart the Enrichment and Indexing topologies. Metron should be ready to receive data. Wait a few moments for data to flow through the system and then check for data in the Elasticsearch indices. Replace yaf with whichever parser type you’ve chosen. Unsure of your Kerberos principal associated with a keytab? There are a couple ways to get this. One is via the list of principals that Ambari provides via downloadable csv. If you didn’t download this list, you can also check the principal manually by running the following against the keytab. You’ll also need to set KAFKA_OPTS to tell the Kafka client how to interact with Kerberos. For sensors that leverage the Kafka console producer to pipe data into Metron, e.g. Snort and Yaf, you will need to modify the corresponding sensor shell scripts or config to append the SASL security protocol property. --security-protocol SASL_PLAINTEXT. Be sure to kinit with the metron user’s keytab before executing the script that starts the sensor. Requested user metron is not whitelisted and has id 501,which is below the minimum allowed 1000. You should then restart Yarn to have the change take effect. Stop the random_access_indexing topology through the Storm UI or from the CLI, e.g. Follow these instructions to enable the X-Pack with Elasticsearch and Kibana. The X-Pack plugin will need installed on each of the nodes running Elasticsearch. You need to be sure to add the appropriate username and password for Elasticsearch and Kibana to enable external connections from Metron components. e.g. the following will create a user “transport_client_user” with password “changeme” and “superuser” credentials. Once you’ve picked a password to connect to ES, you need to upload a 1-line file to HDFS with that password in it. Metron will use this file to securely read the password in order to connect to ES securely. 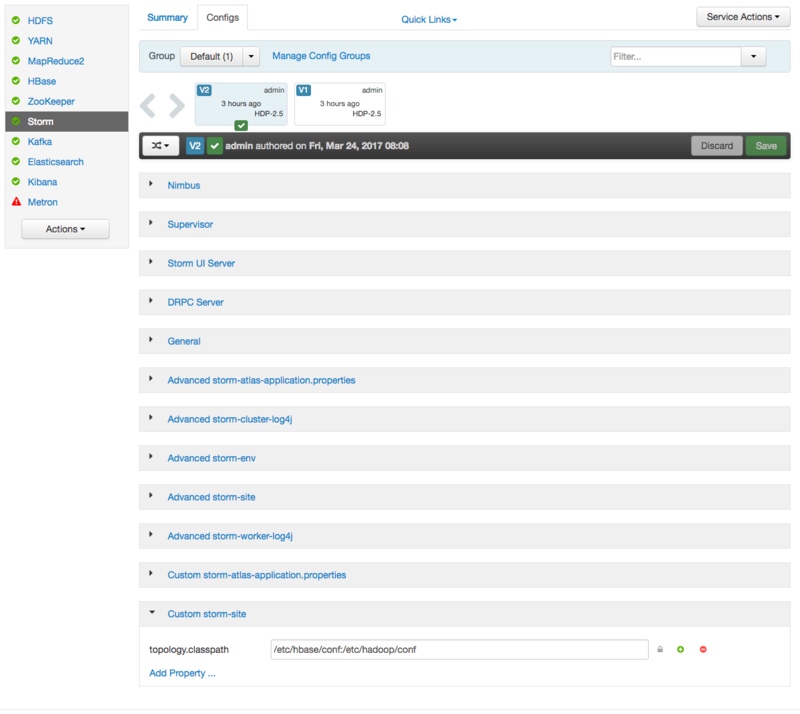 New settings have been added to configure the Elasticsearch client. Now you can restart the Elasticsearch topology. Note, you should perform this step manually, as follows. Restart the metron-rest service, and make sure the elasticsearch-xpack-shaded-5.6.2.jar is in the METRON_REST_CLASSPATH when the metron-rest starts. Once you’ve performed these steps, you should be able to start seeing data in your ES indexes. The random access indexer topology fails with the following exception. This exception might occur on only some of the Storm worker nodes. 2018-07-02 10:24:08.267 o.a.s.util Thread-8-indexingBolt-executor[3 3] [ERROR] Async loop died! This can occur when an HDFS Client is not installed on the Storm worker nodes. This might occur on any Storm worker node where an HDFS Client is not installed. Installing the HDFS Client on all Storm worker nodes should resolve the problem.